You are here: Home » News & Events » What is investment casting? With the appearance of wax material, investment casting, also known as "lost wax casting." investment casting is usually made in the shape of fusible material, in the appearance of the surface coated with a number of layers of refractory shell made of shell, and then melt the shape of the shell, so as to obtain no part of the mold, after high temperature roasting Can be filled with sand casting casting program. As a result of the widespread use of waxy material to manufacture, it is often referred to as "lost casting". silica sol investment casting The shape of the investment casting is generally complicated, the minimum diameter of the castable hole can be up to 0.5mm, and the minimum wall thickness of the casting is 0.3mm. In the production of some of the original components from the combination of several parts, by changing the structure of the parts, designed to be the overall part of the casting directly from the investment casting to save processing hours and metal materials consumption, so that the structure of parts more For reasonable. The weight of the investment casting is mostly zero for several tens of pounds (from a few grams to ten kilograms, generally not more than 25 kilograms), too heavy castings with the investment casting method is more trouble. silica sol investment casting Casting die size accuracy is high, generally up to CT4-6 (sand casting for the CT10 ~ 13, die-casting for the CT5 ~ 7), of course, due to the complex investment casting process, the impact of casting size accuracy factors, such as mold The shrinkage of the material, the deformation of the investment mold, the change in the amount of the shell during the heating and cooling, the shrinkage of the alloy, and the deformation of the casting during the solidification process. Therefore, although the dimensional accuracy of the conventional investment casting is higher Consistency still needs to be improved (using medium and high temperature wax casting size uniformity to improve a lot). When pressing the mold, the cavity surface finish is high, so the surface finish of the investment mold is relatively high. In addition, the shell is made of high-temperature special adhesive and refractory coating refractory coating coated on the investment in the mold made in direct contact with the molten metal cavity surface finish high. Therefore, the casting surface roughness than the general casting of the high, generally up to Ra.1.6 ~ 3.2μm. 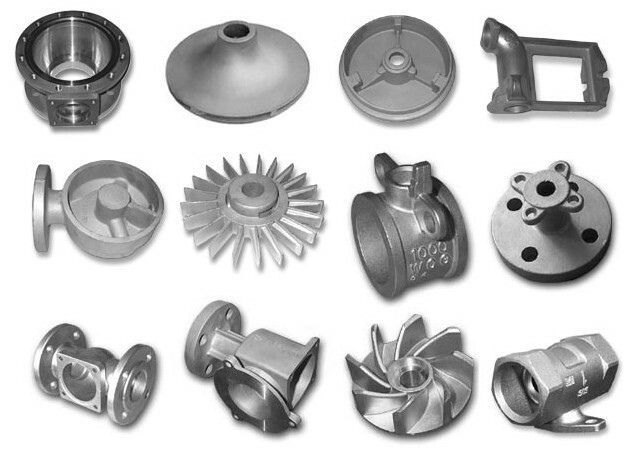 The biggest advantage of investment casting is the fact that the die-casting has a high dimensional accuracy and surface finish, so it can reduce the machining work, only in the parts require a higher position to leave a little margin can be processed, and even some castings only Stay polished, polished margin, no mechanical processing can be used. It can be seen that the use of investment casting method can save a lot of machine tools and processing time, substantial savings in metal raw materials. silica sol investment casting Another advantage of the investment casting method is that it can cast complex castings of various alloys, especially casting high temperature alloy castings. Such as jet engine blades, the streamlined profile and cooling with the cavity, with the mechanical processing technology is almost impossible to form. Production with the investment casting process can not only be mass production, to ensure the consistency of the casting, but also to avoid the mechanical processing of residual stress after the knife.